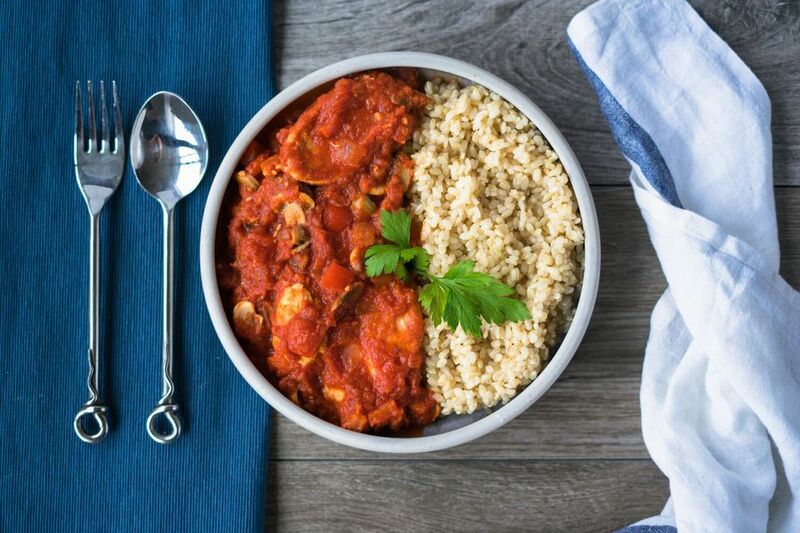 This Spanish-style recipe for chicken with tomato sofrito sauce is a go-to meal when you want something simple, fast, and delicious. First, you'll make the sauce with canned crushed tomatoes, onions, mushrooms, and bell peppers. Next, boneless, skinless chicken breast is pan-fried with Spanish olive oil. Finally, you get to combine all of the parts together for a quick-and-easy Spanish main course. Serve the chicken and sofrito with Spanish-style homemade French fries or rice on the side. Note: while there are multiple steps to this recipe, this sofrito is broken down into workable categories to help you better plan for cooking. Chop the onion and bell pepper and reserve. Mince the garlic and reserve. Trim the stems from the mushrooms, slice them, and reserve. Pour half the olive oil into a large frying pan and heat over medium heat. Add the reserved onion, bell pepper, garlic, and mushrooms and sauté over medium heat, stirring often until onions become translucent - about 7 minutes. Add the crushed tomatoes and their juices and bay leaves and stir. Simmer on medium to medium-low heat for 10 minutes, stirring often. If sauce becomes too thick or begins to stick, pour in a few tablespoons of water. While the tomato sauce mixture is cooking, pour the other half of the olive oil into a large frying pan and heat over a medium flame. Pat the chicken breasts dry with paper towels and season on both sides with salt and pepper. Pan-fry the chicken in the hot oil, turning over twice (for about 10 minutes total cooking time). The chicken should be well-browned on both sides, but might not be completely cooked in the center, which is no cause for concern because it will finish cooking when added to the sauce. After pan frying the chicken, remove the pan from the heat. Remove the chicken breasts to a cutting board and cut them into 1/2-inch thick slices and return to the pan with tomato sauce. Stir to coat chicken breasts in tomato sauce. Cover and cook over low heat for 10 minutes. Taste and add salt and pepper as needed. Serve with rice or potatoes to sop up the delicious sauce. Alternatively, make Spanish French fries as the perfect side dish. Leftovers are never a problem because the sofrito sauce mellows and tastes even better the next day. Both Spanish and Italian styles are typically served with meat dishes and are very similar with a few differences. Traditional Spanish sofrito is characterized by sautéing annatto seeds in pork fat. Chopped onions, bell peppers, garlic, and herbs are then sautéed in the flavored fat until tender and thickened. Some versions omit the annatto and call for chopped tomatoes as in this recipe. Traditional Italian sofrito is similar in that celery, bell peppers, onion, garlic, and herbs are sautéed in olive oil, not pork fat, and thickened.